AndrÈa Stanislav&apos;s new solo exhibition, Land of the Lost, running from Nov. 7 to Dec. 7 at the GAGA Arts Center in Garnerville is a site specific multimedia installation created for the GAGA space. The installation is a dystopic “encampment” consisting of a sculptural formation of silver military tents. Each tent has its own sonic and lighting element that creates a rhythmic pattern of light and sound emanating from within each sculpture. 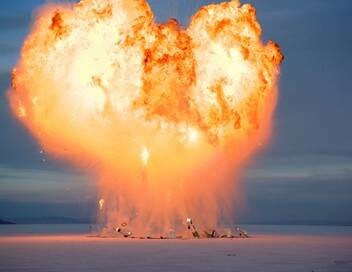 There is a large scale video projection of a spectacular explosion of sculpture that the artist staged in the Great Salt Flats at the Bonneville Speedway -- creating a fireball that rose hundreds of feet above the salt desert. AndrÈa Stanislav is multimedia artist who lives and works in Minneapolis and New York. Stanislav&apos;s body of work is inspired by the language of film, architecture, and pop culture, and includes installation, sculpture, video, photography, and sound. Her installations create experiential environments exploring worlds we can see and worlds we can’t—but know intuitively are real. Stanislav’s work has been featured in numerous solo and group exhibitions around the world. In Gallery B, Brooklyn based emerging artist Gail Heidel presents her installation, Converge, a two-part installation composed of 1123 modular bricks. The work references the contemporary condition of interconnectivity, the reliance on systems and the dualities found within these ideas through the metaphor of the cityscape. The exhibition will run from November 7 to Dec 7. Gallery hours: Fridays 5 to 8 PM and Saturdays 2 to 6 PM. The opening reception will be on Friday, November 7th, from 6 to 9 p.m., with a special live performance by Gamelan Son of Lion, a new music repertory ensemble based in downtown New York City specializing in contemporary pieces written for the instruments of the Javanese gamelan. Gamelan Son of Lion&apos;s instruments were built in village style by Barbara Benary using steel keys, cans for resonators, hubcaps for kempul, etc. There are about a hundred active gamelan ensembles in the United States at the current time. Gamelan Son of Lion now rates among the oldest of these, having performed continuously since 1976. It is also one of the few in this country which operate independently of institutions as a professional music ensemble. For information or directions, call (845) 947-7108 or go to www.gagaartscenter.org. GAGA Arts Center is a not-for-profit organization located in an historic 19th century former textile mill in New York’s lower Hudson Valley whose goal is to foster a creative dialogue between artists and their community through the visual and performing arts.